Rejoice, brothers! 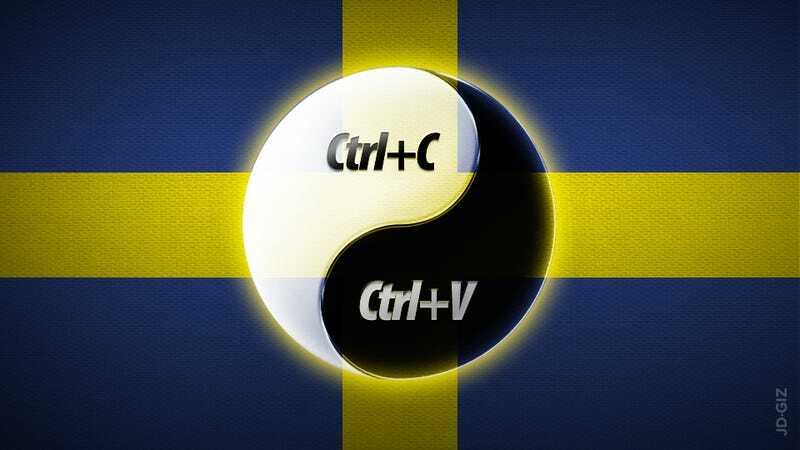 File sharing is now an official religion in Sweden. For real. It took two years, but it's done: it's called the Missionary Church of Kopimism and has Ctrl+C and Ctrl+V as its sacred symbols. I think that more people will have the courage to step out as Kopimists. Maybe not in the public, but at least to their close ones. There's still a legal stigma around copying for many. A lot of people still worry about going to jail when copying and remixing. I hope in the name of Kopimi that this will change. And the Swedes raised the holy torrent upon high, saying, O Lord, bless this thy holy torrent, that with it thou mayst copy thine movies and music in tiny bits, in thy mercy." And the Kopism Lord did grin. And the people did feast upon the lambs and sloths, and carp and anchovies, and orangutans and breakfast cereals, and fruit-bats. And the Lord spake, saying, "First shalt thou find the tracker. Then shalt thou count to three, no more, no less. Three shall be the number thou shalt count, and the number of the counting shall be three. Four shalt thou not count, neither count thou two, excepting that thou then proceed to three. Five is right out. Once the number three, being the third number, be reached, then lobbest thou thy .torrent file towards thy Torrent program, who, being naughty in my sight, shall copy it.